As the middle Texas coast braces for Hurricane Harvey’s landfall, forecast models show that the storm could leave at least 1.25 million Texans without power. 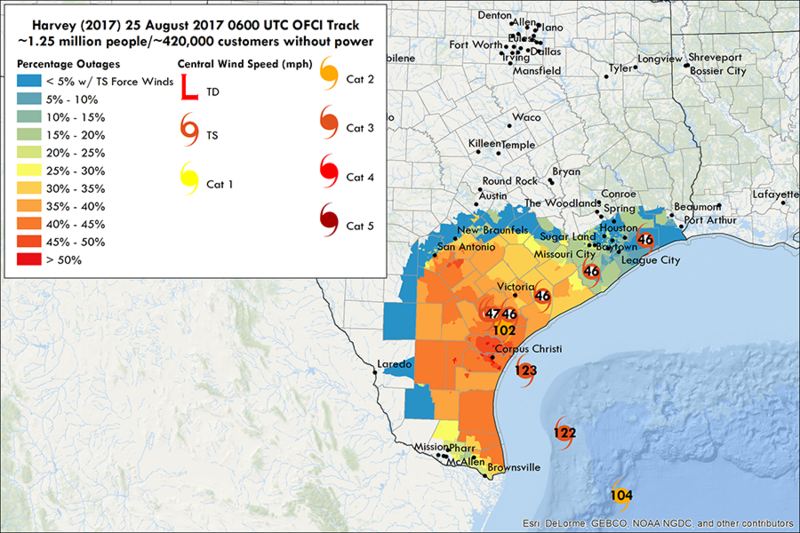 “Our model is forecasting that a significant number of utility customers along the Middle Texas coast and South Central Texas, including Corpus Christi, San Antonio, and Victoria, will experience outages,” said Dr. Brent McRoberts of Texas A&M University’s Department of Geography in the College of Geosciences, who is part of the research team that runs the model. The National Hurricane Center (NHC) updated Harvey to a Hurricane Thursday, describing the storm as “intensifying rapidly,” and predicting its landfall near Rockport, Texas, just north of Corpus Christi, either late Friday evening or early Saturday morning. Storm surge, high winds and flooding are likely. Called the Spatially Generalized Hurricane Outage Prediction Model, the research team’s model uses NHC hurricane data, such as eye location and wind speed and duration, along with environmental variables for each location – elevation, land cover, soil moisture, drought indices, tree and vegetation characteristics, and population densities — to compute a statistical outage forecast. “Power outages are often highly correlated with wind speed,” McRoberts said. The model’s latest prediction shows approximately 420,000 power customers losing power, which would total 1.25 million total people affected in those residences. The forecast model has been developed over a decade at Texas A&M, the University of Michigan, and Johns Hopkins University and the research team now includes McRoberts, Dr. Seth Guikema and Sara Shashaani, of the University of Michigan, and Dr. Steven Quiring, of The Ohio State University. Texas utilities use the research team’s forecast to prepare for tropical storms and hurricanes. And following the storms, they then provide the research team with the actual outage data, which the team uses to refine and improve the model. It’s a mutually beneficial relationship that helps the utilities keep residents and businesses informed, and also helps the researchers keep the model accurate, McRoberts said. Before Hurricane Sandy caused devastating damage in October 2012, the model accurately predicted the number of power outages it would cause in the U.S., he said, and the team has continued to refine and improve it since. For up-to-date power outage forecasts, see the model’s website, which is updated about every 6 hours with the latest data. And for more detailed information about the model, see this journal article.